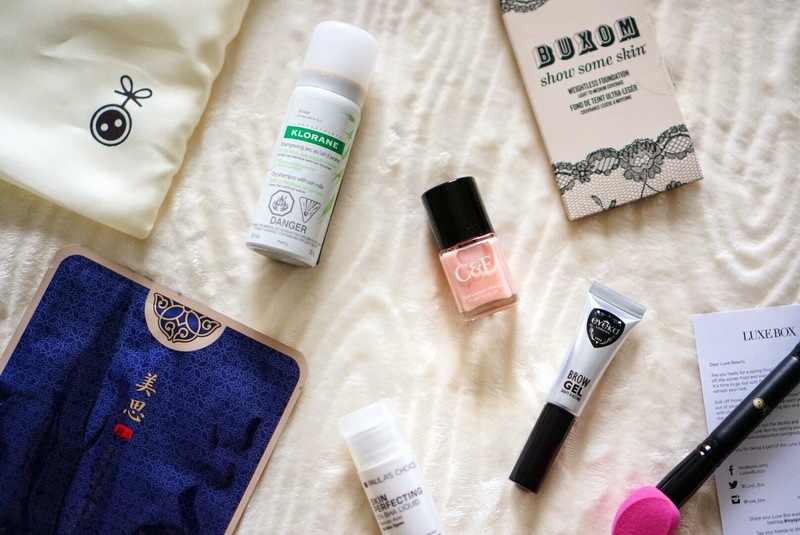 Few months back I got to preview this Spring Luxe Box and am so happy it's finally here. When it comes to subscription box, I have never had one this luxurious and with so many full sizes. 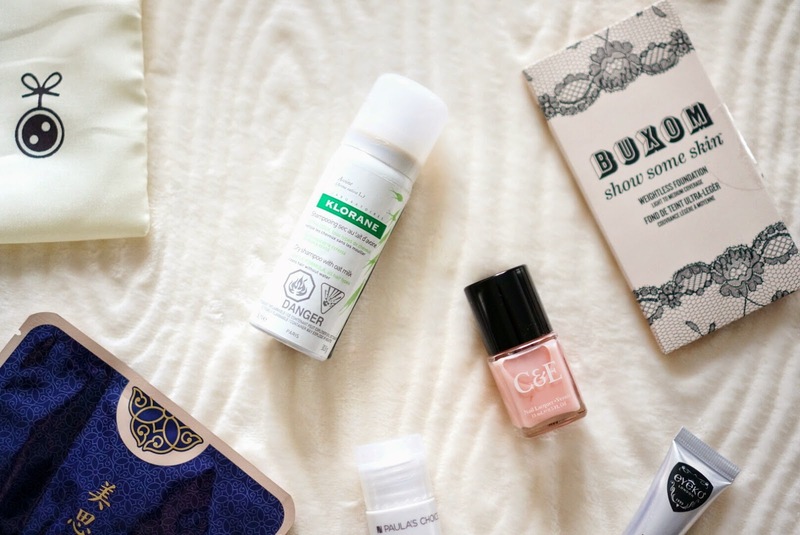 Luxe Box really chooses the right products for us to be ready for the Spring. You start off by becoming a member and creating a beauty profile. Receive a personalized beauty box of 7 - 8 products. The Spring 2015 Luxe Box is featuring many great luxurious brands and with three membership options. Subscription boxes are a great way to discover new brands and new products. For the money you're paying you get a box value of $70+ with complimentary shipping. You can also upgrade to a limited edition box that exclusively features a popular brand. Eyeko Brow Gel: Absolutely Amazing! My brows have been going crazy lately, as they like to head in many directions. But this brow gel really helps me tame them and with the perfect brush it perfectly combs the hair to where you would like it. I've never used brow gel before but never would've thought how great the tint did for me. Now I feel like my face is nicely framed with my brows and can walk out with confidence. Paula's Choice Skin Perfecting 2% BHA Liquid: I've always had trouble with enlarged pores and never seem to be able to find the right product to close those bad boys. I am truly thankful for coming across this product. It helps with pores, redness, acne and wrinkles. If used right, many reviewed that it made their skin radiant. My first impression after using for one week is that although it feels oily, it's a great product to use at night time, it calmed my redness on my cheeks which no other product has done for me before and the pores on my nose is less visible. Luxe Box Double-Ended Brush: I'm excited to receive this product because I love how one end is beauty blender like sponge and the other is a wide foundation brush. I definitely love the sponge applicator more because it works great with foundation when dampened to create a flawless application. Buxom Show Some Skin Weightless Foundation: The unique part of this foundation is that it combines BB Cream and foundation together. Meaning it'll give you more coverage with the BB's hydrating effect. I would like to say this foundation feels really light on the skin, is build-able but has not reached the coverage that I like but it does feels more hydrating than other foundations that I have tried. Klorane Dry Shampoo: Hard for me to tell you how I feel about this product because I don't use dry shampoo. But I opened it and lightly dusted some in my hair and it felt weightless and my hair felt bouncy. But overall, it feels like a great product just not a fan of the scent. Crabtree & Evelyn Nail Lacquer in Petal Pink: This nail lacquer is like the perfect minimalist pink. It's perfect for spring and it feels very elegant with it applied. Geum Sul 24K Gold Collagen Caviar Cotton Sheet Mask: This mask is very hydrating and filled with many beneficial ingredients like caviar and ginseng. I love the scent, it's refreshing but I wished it was a gel-mask as to sheet mask. Then it would glide onto the skin and not get loose. Overall impression is that I'm really thankful to come across this great subscription box. It has introduced me to many new and popular brands. The products are thoroughly picked out and well for all aspects of beauty. Thank you Loose Button Spring Luxe Box for kindly sending me this amazing box to review. 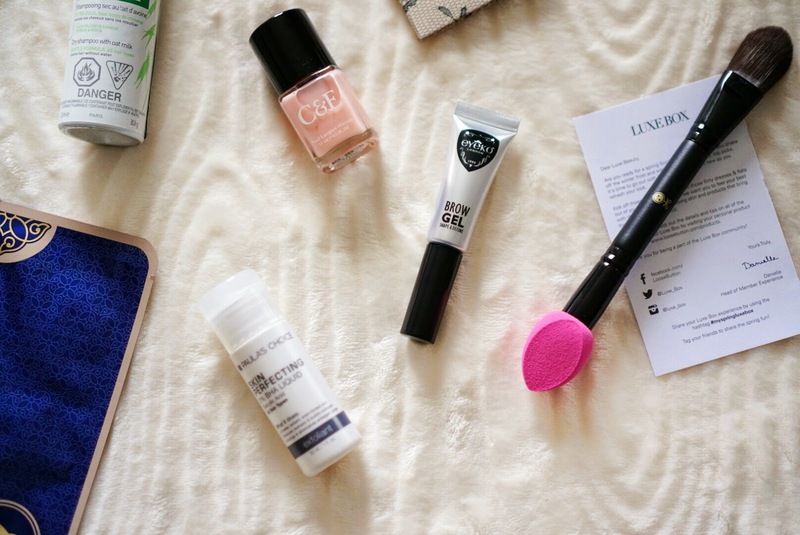 Which beauty subscription is your favourite and which product here interests you the most? I love the Klorane dry shampoo! And the Eyeco brow gel sounds really nice!